Combine ground meats, Worcestershire sauce, mustard powder, breadcrumbs, salt, pepper and egg in a large mixing bowl. Whisk egg lightly with a fork, then use your hands to mix everything together. Don’t over mix. Shape into eight patties, roughly the size of the buns, and set aside on a plate. When ready to grill, preheat griddle pan or barbeque to medium high heat. Lightly oil grill bars. Grill burgers until brown and charred, about 5 minutes. Turn over and grill for 2 minutes more for a medium-rare burger, 3-4 minutes more for a medium burger. Place ingredients in a saucepan over medium heat. Leave to simmer, stirring every so often until rhubarb softens and liquid is released. Continue to simmer, gently, until relish reaches the consistency of jam. Store any remaining relish in a jar, covered, in the refrigerator for up to two weeks. Combine all ingredients in a food processor and blitz until everything is combined. Taste for seasoning, then blitz again. Store any remaining chimichurri in a jar, covered, in the refrigerator for up to 1 week. 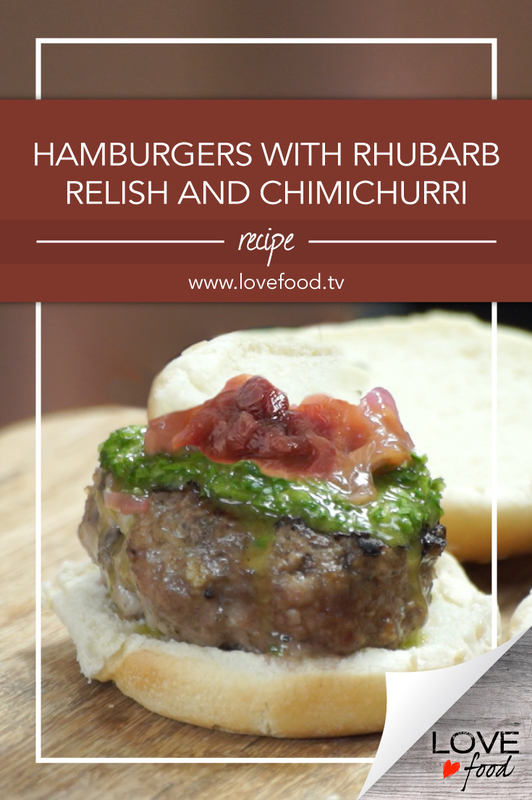 To build the burger, start with a patty on a bun, then top with chimichurri, relish and a tangle of greens. Finish with the top of the bun and enjoy.